Just a Badge, yet Important ? Support Consistent Tsujii-san! On February 28th, a charity concert “One Song, One Dance, One Life” was held to raise funds for a War and Women Human Rights Museum. The auditorium was packed with close to 900 spectators who were mesmerized by the performance held at Tokyo Hitotsubashi Hall. This concert was held in June last year in Osaka where it was well received, and this time the concert was held in Tokyo under the same name. 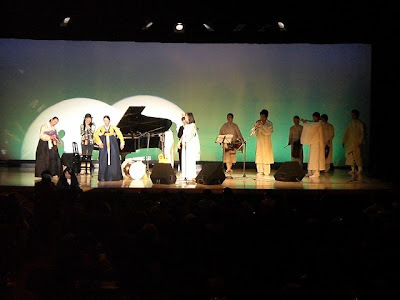 The three zanichi (Koreans residing in Japan) performers Su-ok Cho (dance), Jeong-mi Lee (song) and Seong-mi Ang (Pansori Korean music) dazzled the audience. The program was the same as in Osaka with Pansori, dance, and song, but the art of each performance in three different genres was so interesting that it deeply impressed the packed audience. The audience was diverse including the old and the young, healthy and people with disabilities (Reported by KY). 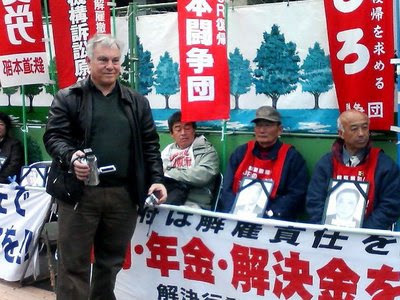 Demand that Mitsubishi Fuso Recognize the Right Of Laid Off Workers To Stay In Dorms! 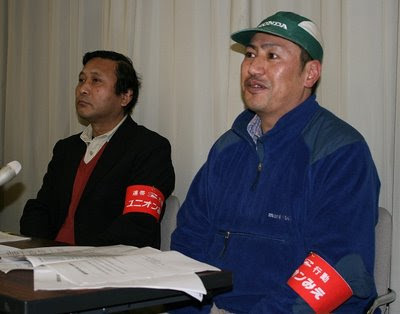 On February 26th, the union successfully managed to get Mitsubishi Fuso to recognize their members’ right to stay in the company dorm as a result of negotiations between Mitsubishi Fuso and Shutoken Youth Union (see photo on right). Members were laid off by the labor hire agency after Mitsubishi Fuso terminated its contract with the agency. 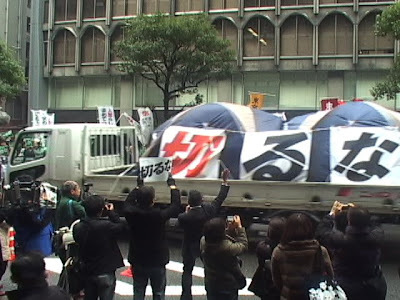 Shutoken Youth Union won this recognition from Mitsubishi Fuso by campaigning outside its head office with slogans such as “We can’t leave the company dorms” and “We demand that Mitsubishi Fuso recognize our right to stay”. This is a significant victory because it recognizes the right of labor hire workers to stay in company dorms after their contracts have been terminated by the labor hire agency (Reported by Shutoken Youth Union). *Photo taken in front of Keidanren on Feb. 25th. In the light rain during the lunch break on February 25th, a performance of “No Cuts” was held in front of the Keidanren. The call out for the performance was made by the Anti-poverty Campaign. The police mobilized large numbers of riot police and security guards, and their overreaction was highly visible as they threatened to arrest the organizers in the campaign vehicle for “illegal parking”. 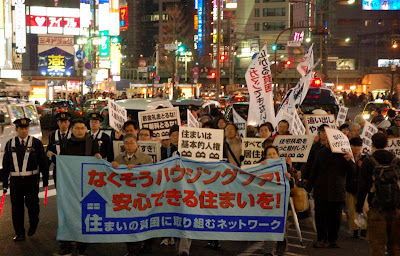 Despite such intimidation, some 150 members of the Shutoken Youth Union, Tobu Union, Gatenkei-Rentai, and Women’s Union turned out for the performance. 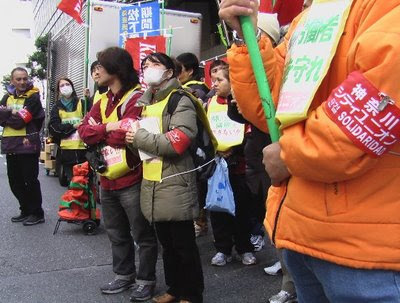 One of the speakers “S”, a worker from Mitsubishi Fuso who had been made redundant at the end of February and told to leave the company dorms, protested that: “I’ve got no money, no job. They say leave, but I can’t.” The crowd shouted words of encouragement such as “You don’t have to leave!” The final performance involved all the participants raising their placards saying “No Cuts” to voice their protest against the Keidanren. Click link to see photos from Mkimpo, link to Anti-Poverty Campaign homepage, or video from UnionTube. 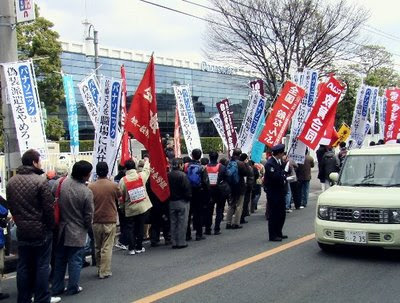 Some 525 people gather to protest against layoffs in Aichi. 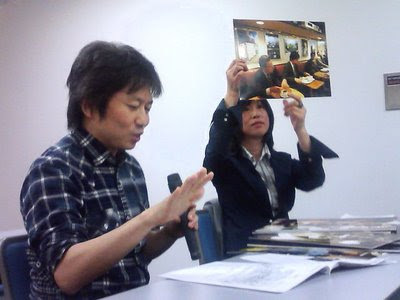 Mr. Yuasa spoke on the plight of workers who can’t say "No". 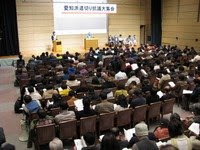 On February 22nd, a mass meeting was held in Aichi at the Telepia Hall in Nagoya in order to protest the successive layoff of labor hire workers in the manufacturing industry (see photo). 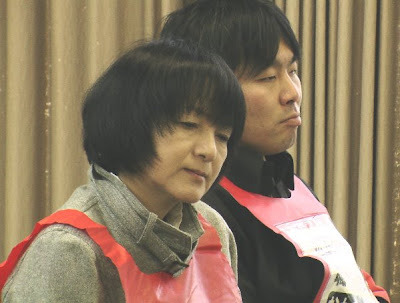 Some 525 citizens and others gathered to the meeting to hear the plight of the laid off workers and Mr. Yuasa’s speech, the organizer of the Tent City that was held over the New Years period. 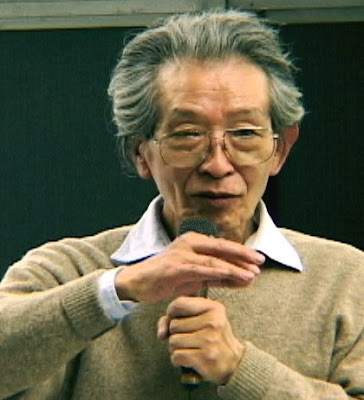 Mr. Yuasa highlighted that: “The Tent City was not simply charity. It is a campaign to enable workers to get out of the downward spiral into poverty, which forces them to accept the degradation of their work conditions, and create a healthy labor market that allows workers to say “No!” to these attacks”. (Reported by Tooru Sakai). Photo provided by Nagoya Fureai Union (click link). 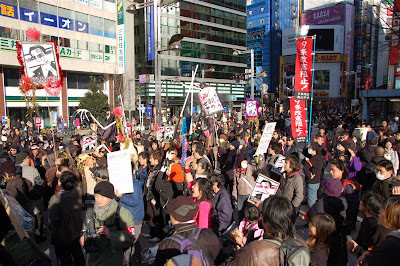 On February 16th, I covered and participated in the Tokyo Collective Action, a joint action involving the unions and individuals in the disputes against the layoffs and attempts to crush unionism. Unions included the Keihin Hotel Union, who had been fighting hotel closure by running the hotel independently of management, and Brazilian workers from the Kanagawa City Union (see photo). 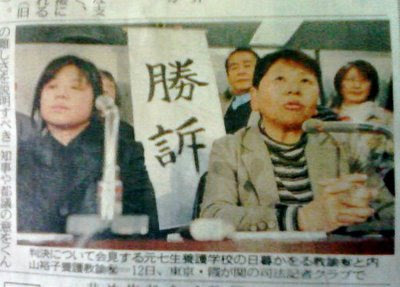 Others were also present such as Tsutomu Yoshioka, involved in the dispute against the use of contract workers who do not have the benefits of labor hire workers, Fukuzou Honda, a worker who was laid off during his trial period, and the National Railway Workers, who have been fighting for over 22 years against the privatization of rail. Those involved in the Toyota Philippines dispute also participated. 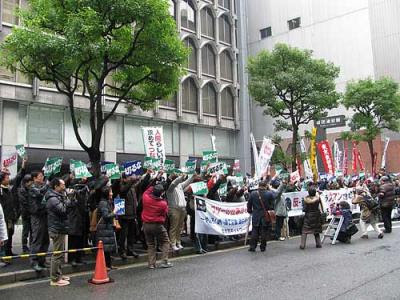 It was an invigorating day and I felt that the global campaign to build joint action between non-permanent and foreign workers was gaining strength in Japan’s labor movement (Reported by Osamu Kimura). 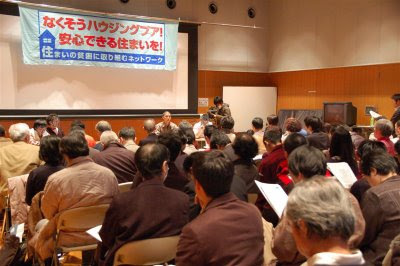 A trade union for protecting the rights of fixed term employees has been organized at Honda Motors Co., Ltd. Union Mie Honda Unit. 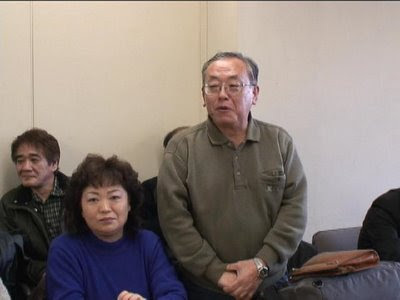 On February, Union Mie publicly presented its member Mr. Takeshi Kitagawa (at the right in the photo) to submit a letter of request to the headquarters of Honda. Mr. Kitagawa's appeal says, "Why are we "term" employees put in a weak position? It is because we are not organized in a union, I suppose. A labor union is not a privilege only granted to regular employees. It is a right granted to all workers under Article 28 of the Constitution of Japan." * Photo = A scene from a press briefing at the prefectural office. "Hey, Aso, don't demise automatically. Wait so we can knock you down properly!" 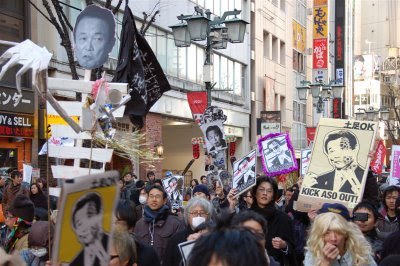 --- A demonstration took place on February 8 an the main streets of Shinjuku, Tokyo, calling to stand up for democracy instead of allowing irresponsible self-demolition of the administration (staged by an ad hoc committee). Starting at the Okubo Park behind the Shinjuku Koma Theatre, about 200 participants went through Kabukicho to the Yasukuni street. A video-shooting crew from the security police was before the front line of the demonstration. Police officers from the PR section repeated spiritless warnings while walking around with a transistor megaphone. In the face of surrounding policemen in uniform or in plane clothes, participants mightily beat the instruments they had brought with them and appealed loudly in rhythmical chants, "Get down, Aso! Let's overthrow Aso!" This performancewas even more vitalized with participants in ingenious guises. (Y) See the initiator's blog. 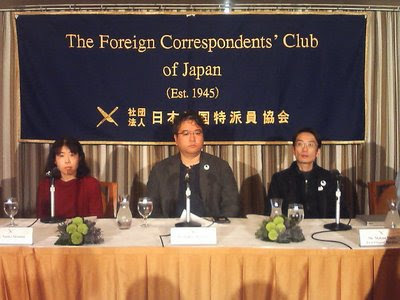 The November 2008 regular meeting of the Asia Press Club had a lecture by Mr. Takashi Hirose entitled "Who is the culprit of the financial crisis?" which has recently been released in the form of a DVD. 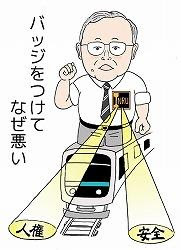 Mr. Hirose (see the photo) tactfully used PowerPoint images and documented material to show the essential of the world finacial crisis and its mechanism in a straight forward manner. In particular, he gave real names of the persons in the US financial circles and in the pivotal positions of the US administration as "the financial criminals." The audience appreciated this lecture highly as "an awakening lecture." Asia Press Club has released the DVD in haste in order to distribute the contents of the lecture to a broader range of people. Priced at 1500 yen. 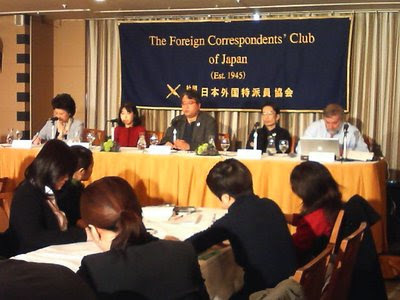 On February 4, the Foreign Correspondents' Club of Japan, based in Tokyo, had a press conference on the povety and employment issues. The three guest speakers were Mr. Makoto Yuasa, the director general of NPO Moyai; Mr. Makoto Kawazoe, the secretary general of the Metropolitan Youth Union (General Youth Chapter of Tokyo Metropolitan General Workers' Union); and Ms. Naoko Shimizu, the president of FRZK (union of general part-timers, arbiters, freeters and foreign workers) (see the photo). 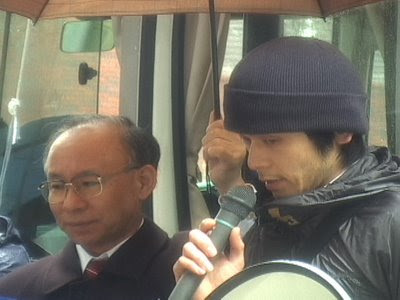 At the beginning, the DVD "Tent City for Jobless" (6 minutes, English version) was shown. Mr. Yuasa said, "Within labor market, the quality of employment has degraded as represented in the worker dispatch business and outside the labor market, no safety net is functioning. These are the causes of the povety peculiar to the situation in Japan where unemployment immediately means the homeless status," pointing out the two factors in particular. Mr. Kawazoe reported on the inhumane working conditions of dispatched workers. Ms. Shimizu released the new action development, saying, "Our union would like to rent apartments so that we can provide inexpensive shelters for laid-off dispatched workers."